Today, a champion, Madigan is quite the guy. 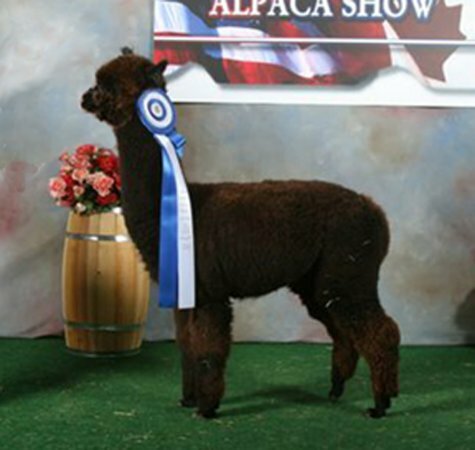 At his first show, he took home his first ribbon, a blue in a most competitive class at the 2008 North American Alpaca Show, and in so doing beat the Futurity Reserve Champion!! He was also awarded another blue ribbon at the 2008 Empire Extravaganza in New York. Judge Wade Gease said about Madigan: "Dramatic, consistent crimp-style all the way to the tip and throughout the fleece." Madigan has correct conformation, with strong bone and an excellent bite. His very dense, black fiber is silky, and buttery soft with a fine, high-frequency crimp. Madigan is extremely friendly and his curly face attracts the attention of many farm visitors. Judge Wade Gease has commented on how wonderful his crimp style was.. from the tips of the staple all the way down! He is a true black, out of a Canadian dam and the 2004 AOBA Reserve Black Champion. His paternal grand sire is the renowned Black Shadow and his dam was Reserve Champion at the Empire Extravaganza the only time she was shown. Madigan took a Blue Ribbon and a Reserve Championship at the Big E, in West Springfield. 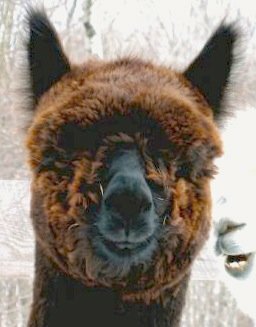 Co-owned with Lotta Luv Alpacas Ltd, Upton, MA and Snow Angel Alpacas in Vermont. For more information or photos please email us at info@islandalpaca.com. Thank you! Stud Fee: $2,000, Drive-by's available. High Plains Gracey came from Canada and brings new bloodlines to the United States. Shown only once she took the blue ribbon and Reserve Color Championship at the Empire Extravaganza 2005 under Dr. Julio Sumar. Gracey is probably the densest gray ever felt. Her sweet disposition and calm demeanor make her a favorite with visitors as well as with us. She is a wonderful mother with abundant milk. 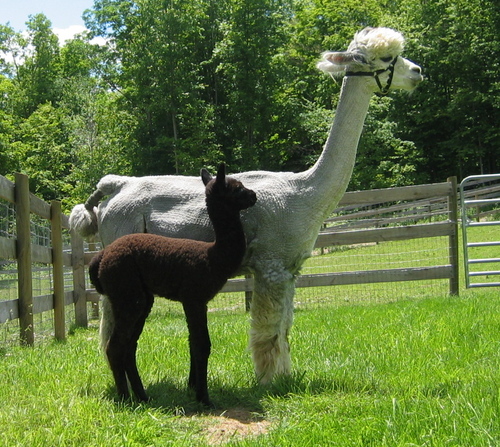 Her cria weighed in at 50 lbs at 3 months of age. 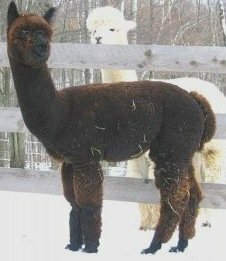 Gracey's 2007 male cria out of Grand River Mezcal, is outstanding. 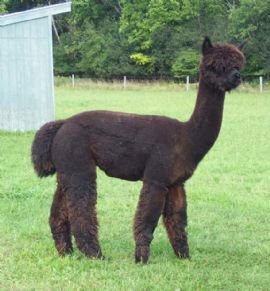 He is conformationally correct, carries himself with pride, has a beautiful head and a dense but soft fleece with good character. He is headed for the show ring this Spring. 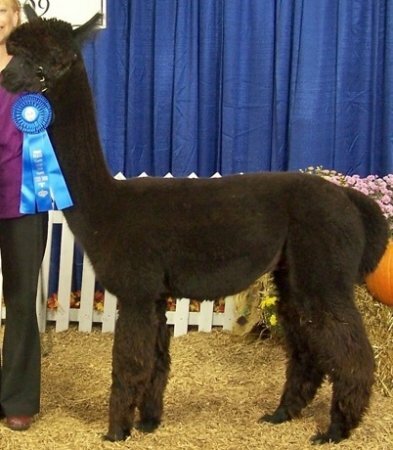 UPDATE: Madigan, her 2007 cria, just took the blue ribbon in a class of 15 at the North American Alpaca Show, winning over some of the best black juvies in the country. Mezcal is, in our opinion (and that of renowned judges) one of the finest black huacaya males in the nation. His sire is Dark Shaddow (Dark Reserve Herdsire of the Year at the 2006 Futurity; 1st place Get of Sire at the 2004 Kentucky Classic, [of which Mezcal was a part]; 3 Championships, and more). Mezcal himself has accumulated an impressive array of awards (see below), including: 1st Place and Reserve Championship award at the AOBA 2004 National Show, out of 50 of the finest black males in the country, at only 8 months of age! In this highly competitive show, the largest at that time in North America, Mezcal beat out Crescent Moon's Kryptonite, himself a National Champion in 2003, whose 1/2 interest sold for $175.000!! Mezcal is the Real Deal!! "Mezzie" has extraordinary fleece: bright, with lovely crimp, literally from head to toe. His fleece handles like butter, soft, with excellent density and coverage. 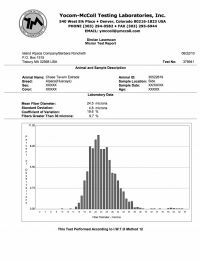 His last histogram, at age 32 months, indicates his inordinately uniform fleece, with an SD of 3.7 and a CV of only 13.7!! He is a striking male, strong-boned and conformationally outstanding. He has a classic huacaya head. Bite and testicular development are excellent. He is one of the most balanced males we have seen, moving gracefully and always presenting a "photo-op". He has a very easy-going temperament, something we value in a herdsire. Mezcal's dam is a Guellermo daughter, further solidifying his genetic foundation. Mezzie's first offspring to show, Madigan, just took 1st Place out of 15 at the competitive North American Show! And more recently, another blue at the Empire Show in New York. Mezcal's crias are solid, strong-boned; fleeces are bright, uniform, and fine.